touring bikes | Bikes, Beer, and Birds... In No Particular Order. Just Riding Along… Back in the saddle. Just Riding Along… Donut ride. Quick ride on the Little Miami scenic path this morning. Thought I would use the Cannondale today, one, to see if my rear wheel is holding up, and two, to see if I could fine tune the shifting a bit. But, the main reason for the quick jaunt today was to get donuts. After my quick spin, I headed down to Ms. Cheri’s in downtown Milford for a few amazing donuts for breakfast. Such a great place if you are ever in the area. Just Riding Along… Day 19. I feel that this sticker sums up my month long experiment. Kind of in a dirty way, but still sums it up. Tonight’s ride, in the rain, was a quick little jaunt to the grocery store to buy some beer. Only around 4 miles total, but a nice quick ride, late in the night. This was also my first time loading up the T500, which it surprised me quite a bit. After riding it for a while with the flat bar setup, I had forgotten that it is a tried and true touring bike. I did not even notice the weight of the 10 bottles of beer strapped to the rack. True, not a lot of weight, but you would expect to feel something. The only time it was noticeable was when I stood and danced on the pedals while climbing. To get the beer home, I used a canvas reusable grocery bag, a ratchet tie down strap, and a bungee cord. Worked pretty well, but I think some panniers are in order for this bike! At work, we are doing a holiday beer exchange. Six people bringing in six different holiday brews, and everyone take one of each. Pretty straight forward, and easy idea. My selection is from Clipper City brewing, their winter Heavy Seas. The other selection I have wanted to try for quite some time, North Coast’s Old Stock Ale. I really like North Coast, so I am sure this one will not disappoint. Tomorrow is day 20, planning on a morning ride to mix it up a bit. I cannot believe how fast this month is going, 2012 is almost here. This bike has come a long way from when I first acquired it. (You can read about that here.) The big change is the riding position. Drop bars are gone, and replaced with a nice mountain riser bar. This gives you a nice upright stance, so you can take in your surroundings, and not stare at your front wheel or the road. These bars make you slow down a bit and enjoy your ride a little more. Also gone with the drop bars are the road style shifter/brake levers, which were replaced with Avid FR-5’s and an old Shimano friction shifter. I am completely excited with the shifter set up, having never used friction shifting before. All I can say is smooth. Still needs a little tweaking, but overall a very nice shifting feel. No front derailleur, only 8 cogs on the cassette. I have always liked the simplicity of a single speed, so this is a logical step in the direction of gears. Speaking of gears, they are being managed by an older Shimano Deore rear derailleur that I have had laying in my parts bin patiently waiting for action once again. Eventually this will probably be switched to a short cage derailleur, but for now, this is the bees’ knees. Other parts rounding out the bike are my well worn set of Shimano XTR pedals. These guys are rock solid and in my opinion, you can not find a better pedal. An oldie but goodie Blackburn rear rack, and an equally old Selle San Marco saddle make this budget bike stand out from the rest. This bike came together better than I ever expected. And to top it off, it came together very cheaply. The only parts that I needed to purchase were the brake levers, a couple tubes, and a new chain. Not too bad in my opinion. This bike will serve my wife (and me!) for quite the years to come. Vassago Fisticuff: Self described as “A love child between a 29er and a cross bike.” I couldn’t agree more. Clearance for wider 700c ‘cross tires, or up to 2.0″ 650b, with rack and fender mounts. Seems to be pretty versatile. The only downfall for this is it is a frame set only, which unfortunately I do not have a sufficient parts bin to build on up. Nice bike though. Surly Ogre: This bike has it all. Rack mounts, front and back? Check. Fender mounts? Check. Fatties fit fine? Check. Single speed ready? Check. Mounts for a trailer? Check. Looks like the Surly Troll? Check. This bike is like the Troll’s big brother. Basically it is just the 29er version. Amazing. I really think there is not a bike that Surly has done that I have not liked. I am a Surly whore without a Surly, something about that is very wrong. Two more very nice rides to add to my list. 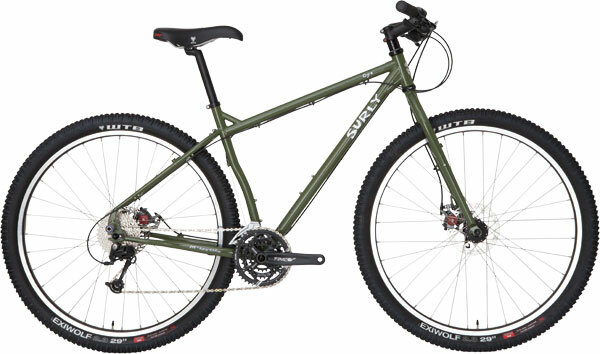 I think at this moment, the two bikes in the contention for my next bike are the Salsa Fargo 2 or the Surly Ogre. Thanks for playing! Photos from Vassago and Surly respectively. Earlier this year I picked up an older Cannondale touring bike for my wife, thinking she might want to ride a bit. Normally I do not go out looking for bikes for her, but I ended up getting an amazing deal on this one. This bike has an interesting story though: My friend has had it in her basement for years, holding it for her friend who needed a place to put it while in college. But this bike was not just some recreational toy, it was ridden completely across the country! My friend’s friend, bought it only to ride across the nation, and when she came back home, she stashed it in my friend’s basement. Wow. Great history on this bike. So what am I going to do with it? My plan from the beginning was to turn in into more of an “errands” bike. Sure I have my cargo bike, but sometimes it is just too much. This bike would fill that gap. Also I figured that my wife would like a road bike in this setup, but maybe later in life, as for the moment, no. Luckily, my wife and I share similar size bikes!